The Democrats just got some really bad news from a noted liberal legal scholar. Writing a terrifying op-ed for the left, he shows clearly that using Obama’s precedent, Trump will win the wall fight in the courts. 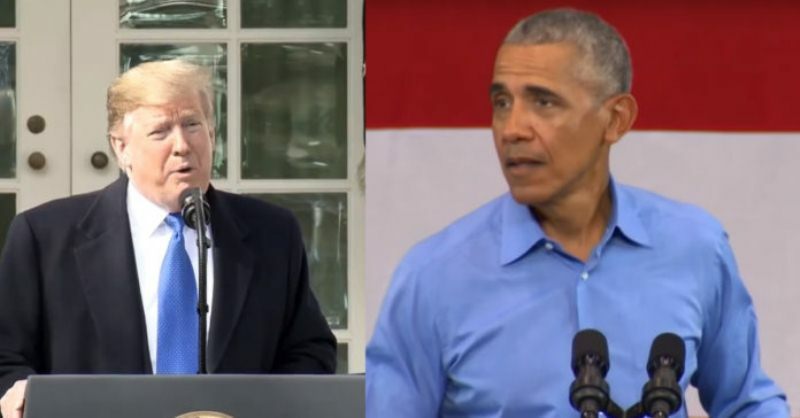 This would be a devastating blow to the opposition and it will happen, according to Jonathan Turley, because the courts will have to decide in Trump’s favor based on Obama’s precedent. “Justice Oliver Wendell Holmes once said, “If my fellow citizens want to go to hell, I will help them. It is my job.” What he was expressing is the limited role of courts in challenges to federal law. It is not their task as judges to sit as a super legislature to question the priorities or policies of the political branches. They will gladly send Congress to hell. It only needs to be clear about the destination. In the matter of the border wall, Congress could not have been more clear where it was heading. It has long put itself on the path to institutional irrelevancy, and it has finally arrived. While I do not agree that there is a national emergency on the southern border, I do believe President Trump will prevail. This crisis is not the making of Donald Trump. It is the making of Congress. For decades, Congress frittered away control over its inherent powers, including the power of the purse. I have testified repeatedly before Congress, warning about the expansion of executive power and the failure of Congress to guard its own authority. The two primary objections have been Congress giving presidents largely unchecked authority and undedicated money. The wall controversy today is a grotesque result of both failures. In 1976, however, Congress gave presidents sweeping authority to declare national emergencies under the National Emergencies Act. While this law allows for an override by Congress, the authority to declare a national emergency is virtually unfettered. It is one of many such laws where Congress created the thin veneer of a process for presidential power that, in reality, was a virtual blank slate. At the same time, Congress has continued to give the executive branch billions of dollars with few conditions or limitations. That is why President Obama was able not only to go to war in Libya without a declaration but to fund the entire war from billions of undedicated funds. At the time, neither House Speaker Nancy Pelosi (D-Calif.) nor most of the current Democratic leadership made a peep of objection. Democrats have indicated they will rely on the ruling in House of Representatives versus Sylvia Burwell, in which a court not only ruled that the House of Representatives had standing to sue over executive overreach but that Obama violated the Constitution in ordering the payment of billions to insurance companies without authorization from Congress. I was the lead counsel for the House of Representatives in that case. Ironically, Pelosi vehemently opposed the litigation as a frivolous and unfounded challenge to presidential authority. We won. Superficially, the Burwell case may look like the current controversy. Obama sought funds from Congress and, when unsuccessful, acted unilaterally. The difference is that Obama ordered the money directly from the Treasury as a permanent appropriation, like the money used annually to pay tax refunds. Congress never approved such payments. Conversely, Trump is using appropriated funds. Like the authority under the National Emergencies Act, Congress gave this money to the executive branch without meaningful limits. Trump now has more than $1.3 billion in newly approved funds for border protection. He has identified about $8 billion in loosely dedicated funds for military construction, drug interdiction and forfeitures. Even if a court disagreed with the use of some of this money, Trump has the authority and funds to start major construction of the wall. Congress has yielded more and more power to the executive branch over decades. In many areas, it has reduced the legislative branch to a mere pedestrian in government, leaving real governing decisions to a kind of “fourth branch” of federal agencies. For their part, presidents have become more and more bold in circumventing Congress. When Obama gave a State of the Union address proclaiming his intention to circumvent Congress after it failed to pass immigration and other measures, Democrats applauded rapturously. Many of them, like Pelosi, denounce this unilateral action by Trump yet ecstatically supported the unilateral actions by Obama, including his funding of critical parts of the Affordable Care Act after Congress denied any funds. Democrats insist Trump can be challenged on his use of emergency authority since they do not believe an emergency exists on the border. They will fail in spectacular fashion if the case gets to the Supreme Court. While the source of funding can be challenged, there is no compelling basis to challenge the declaration itself. That brings us back to Holmes. Congress has the authority to rescind the declaration of Trump with a vote of both chambers. It should do so. If it cannot muster the votes, however, a federal judge is unlikely to do so. Simply put, the courts were not created to protect Congress from itself. Congress has been heading to hell for decades, and it is a bit late to complain about the destination”, Turley concluded to devastating effect.